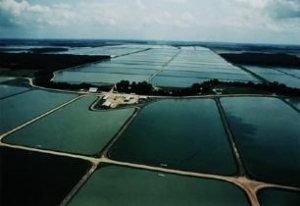 Lots of folks ask us if we operate our own catfish farm. In fact, our Mississippi catfish come from USDA inspected producers of the best cared for and thus the best tasting catfish in the world. Here are a few snap-shots of the process. Soy and corn-based feed pellets are fed twice daily. 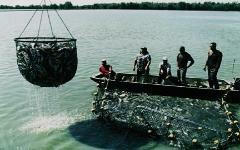 Floating at the surface the catfish become conditioned to feed on the top rather than the bottom of the pond. 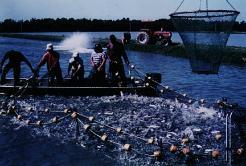 At harvest time the pond is seined with a net sized to allow any immature fish to escape. The fish must pass a flavour test before a pond is harvested. Heartland Catfish has had the same flavour tester for many years. What a job! 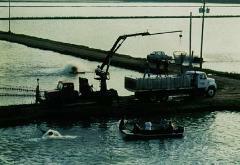 …transporter trucks filled with water like huge mobile aquariums keeping the catfish alive all the way to the processing plant. Fish are sampled for proper flavor at this point as well. 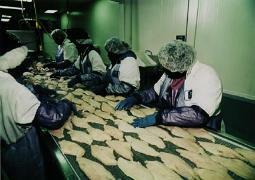 The catfish are quickly processed in HACCP certified and USDC inspected processing facilities. 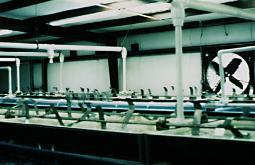 In addition to the automated processing, a visual inspection of all fish is performed in large refridgerated rooms. The flavor tester must approve the fish at this point as well. 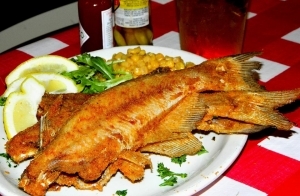 Upon the tester’s approval the fish are packed and shipped to your plate here at Catfish Deweys!